On the very right-hand fringe of the Soldier Kings European map sits one of the game's most powerful minor countries, Crimea. As one of those countries that no longer exists, its presence is a mystery to some, but for centuries the Crimean Tatars struck such fear in Eastern Europe that mothers did not dare tempt fate by threatening misbehaving children with them. On the plains north of the Black Sea, descendants of the Mongol Golden Horde remained in place long after the death of the Great Khan ended the invasion of Europe. Nogai, grandson of Genghis Khan and unofficial leader of the Golden Horde, had established a semi-independent dynasty there by the year 1300. Even after the Golden Horde re-asserted its authority, the Crimean beys retained substantial autonomy, and were made rich by trade with the Genoese outposts on the southeast coast of the Crimean peninsula — the leading port, Caffa, is best known as the source of the Black Death that devastated Europe. Islam arrived in the 13th century, and by the time of Nogai the Sunni branch had become the dominant religion. Although a literate people from the inception of Islam, the Tatars have never translated the Qu'ran into their own language. That all changed in the 1430s when the Crimean Tatars, as they were now known, invited Haji Giray to become their khan and lead their struggle for independence from the Golden Horde. Haji was a descendent of Genghis Khan (a prerequisite for rulership in the Mongol sphere; even Ivan the Terrible made the claim) and a politically astute leader. He forged alliances with both of the region's rising powers — Muscovy and the Ottomans — and leveraged these against the rapidly decaying Golden Horde. By 1441 he was coining his own money and Crimean independence was secure. 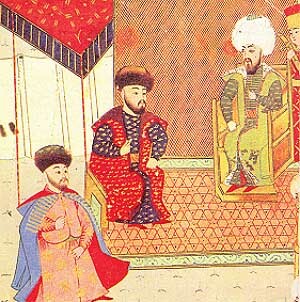 Haji Giray sits at the feet of his "brother," Mehmed the Conqueror. After Haji's death, civil war broke out among his relations, with his son Menli and another relative, Nurdevlet, making the strongest claims. Each was alternatively supported by the Genoese, who still controlled five small ports in Crimea and hoped to keep the Tatars weak and divided. But in 1475 an Ottoman fleet arrived to put an end to these distant Italian colonies — Sultan Mehmed the Conqueror had not forgotten Genoa's contribution to the defense of Constantinople against his armies. The Ottomans took the ports one by one, and for good measure they besieged the tiny principality of Theodoros. This Greek-ruled offshoot of the Byzantine Empire occupied the areas around the modern Bay of Sevastopol and the valley just to the east. Its people, known as the Crimean Goths, were the last remnants of the great Gothic kingdoms of late Antiquity and spoke a Germanic language. The Turks found Menli chained to a dungeon wall in Caffa, the center of the Genoese colonies. The Ottomans returned him to power by force and drove off Nurdevlet, the favorite of the Genoese. While the Ottoman campaign went on, an army from the Golden Horde surged into the peninsula to re-assert the Great Khan's authority, only to be driven off by the Ottomans. Ottoman chronicles are confused regarding the exact sequence, but both Menli and Nurdevlet appear to have been installed, deposed, imprisoned and rehabilitated by the Ottomans several times each before Menli was put on the throne once and for all in 1478. Theodoros and the formerly Genoese ports were kept by the Ottomans as a sanjak, or province, ruled by an appointed governor. But the rest of the peninsula, plus the steppes between the Sea of Azov and the River Dnepr, formed the independent khanate. The khan was not appointed by the sultan, who referred to him as "brother" but did however hold the right of approval over the installation of a new khan. The khan issued money and Friday prayers were said in his name — the marks of an independent sovereign in the Islamic world. "Tatar's Dance," Juliusz Kossak. 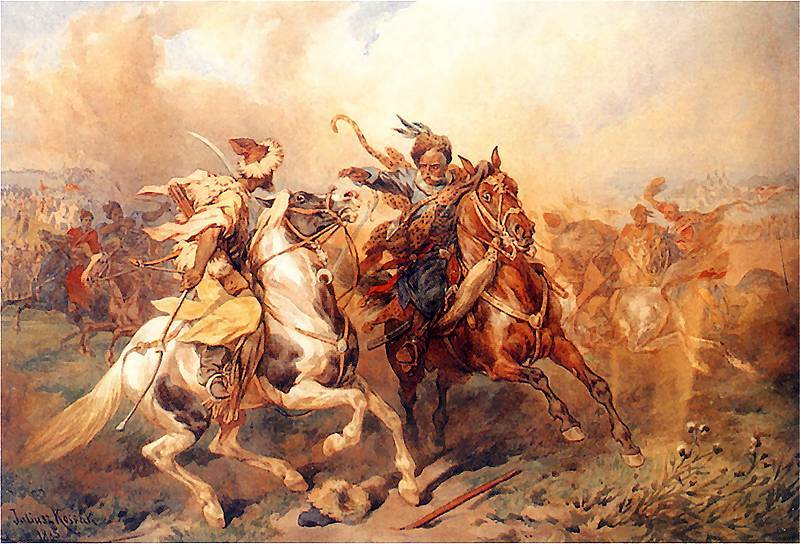 Crimean Tatar (left) used his pony's speed and a whip to hold off a Polish "winged hussar." Menli led a large contingent of Crimean cavalry alongside Sultan Bayezid II in 1484, marking the start of three centuries of a Turk-Tatar military alliance and a less pleasant tradition. The combined armies besieged the Moldavian fortress of Akkerman on the Black Sea coast, and its garrison surrendered after the Turks assured its commanders that they had reached an agreement with the prince of Moldavia for the troops and civilian inhabitants to depart peacefully. When the Moldavians were out from behind the walls, Menli pointed out that as an independent ruler he was not bound by any such convention nor were his men. The Tatars rode down the startled and now defenseless garrison and slaughtered thousands, both soldiers and civilians, and carried off thousands more as slaves. For the next 300 years, slave raiding would be the foundation of the Crimean Khanate's economy. Three million people passed through the huge slave market at Caffa — over 10,000 people per year. Most were Ukrainians, with large numbers of Poles and Russians as well. Raiding parties, known as tchambuls, roved northward into the Ukrainian steppe in search of new victims even during peacetime, seeking not only to find profit but to preserve a wide uninhabited buffer zone between the Khanate and its hostile Christian neighbors. Calculations of war and peace often rested on the number of slaves to be taken, current prices, and market conditions. Very few slaves remained in the Khanate — almost all were exported across the Black Sea to Constantinople. Roxelana, favorite concubine of Sultan Suleiman the Magnificent, passed through the Caffa market sometime in the 1520's. Slave raids undertaken without the Khan's permission were officially banned but as the punishment consisted of a heftier tax on any slaves taken, the ruler did not remain angry long when his riders defied his edicts — traders paid 10 percent on slaves taken legally, 20 percent on those taken without official sanction. Even unwary Christian allies of the Khan could find themselves in chains. The Tatars built impressive cities with their profits; Bachisaray, their capital, was one of the Islamic world's great cities, noted for its Islamic schools and library. 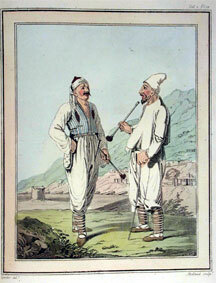 Two Crimean Tatars during peacetime, enjoying a friendly pipe. Tatar slave raiding led directly to Poland's formation of Cossack bands, pledged to protect the borderlands from these enemies. Yet often the Cossacks found themselves having more in common with the Tatars than with their Christian overlords, and a quiet trade developed where these protectors sold their peasant charges to the enemy. Tatar cavalry also rode to the aid of Cossack rebellions against their Polish overlords. The Khan possessed immense military potential. Most of his people living on the steppe made their living herding cattle. On the peninsula itself, a strong leather industry developed along with metallurgy and agriculture — fruit, wine and tobacco. Non-Muslims appear to have suffered little if any harassment, though they were subject to special taxes in exchange for their exemption from military service. All Muslim men were expected to ride at the Khan's command, and the Crimea regularly put armies exceeding 100,000 hardened light cavalry into the field. These armies were organized similarly to the old Mongol hordes, in units of 100, 1,000 and 10,000 riders. There were no other services; the Tatars depended on the Turks to provide engineers, artillery and infantry when necessary. The men carried a curved sword, a bow and a lance until the end of the khanate. Firearms were often disdained for the more rapid fire possible with arrows. The high point of Crimean military exploits came in 1571, when a Tatar force led by Khan Divlet Giray torched Moscow. But already the Ottoman-Crimean alliance was starting to chafe, as Sultans demanded rather than requested Tatar participation in their military campaigns and the Khans pursued independent diplomacy with Turkish enemies like Persia and Poland. Meanwhile, Muscovy's power grew as the tsars smashed the khanates of Kazan and Astrakhan to the east. The Khanate in 1720, already in decline. To keep the khans in line, the Ottomans usually kept at least one pretender to the throne at hand, and khans regularly gained and lost the throne, some of them three and four times. But during the 1640s, Islam III Giray managed to separate Cossack loyalties from Poland, and Turkish and Tatar forces advanced into Ukraine with an eye toward expanding their influence northward. But the Cossacks turned to Moscow in 1654, and the Turkish defeat in front of Vienna in 1683 changed everything. Crimean armies now fought in the Balkans to stem the Austrian advance while Polish and Russian invasions also drove back the alliance's borders. While the front would eventually be stabilized, the Khanate was on the defensive for the rest of its existence. The Russians pressed steadily southward, and in 1736 a Russian army briefly captured Bachisaray, burning the Khan's palace, the Islamic school and the massive library. The Russo-Turkish War of 1768 to 1774 was disastrous for the Khanate. After a successful large-scale raid, the Tatars proved unable to stop a Russian invasion of the Crimea while promised Ottoman reinforcements failed to arrive. The Khan fled to Constantinople, and the nobles left behind intrigued with the Russians to cut the Ottoman ties outright. 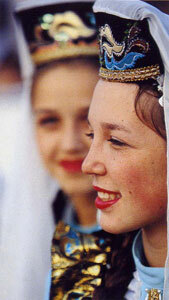 Crimean Tatars just outside Ankara. The Treaty of Kuchuk-Kainarji in 1774 gave the Khanate supposed independence but codified Russian influence. Sahin Giray, the last of the khans, tried to re-organize taxation to fund a modern, Western-style military structure but the nobles, previously exempt, followed the example of countless other nations and violently resisted. Catherine II used her treaty rights as a pretext to interfere in one of the incessant civil wars in 1783, annexing the Khanate's lands and exiling Sahin, who was eventually executed by the Turks. While Catherine supported Islam in the belief it could be used to make her subjects more pliable, later rulers had a much less benevolent view. The Tatars would be steadily repressed under the tsars, until in 1944 Josef Stalin declared them "potential traitors for all time" and hundreds of thousands were massacred or exiled to Siberia. Many fled to Turkey, where a vibrant community remains. In Soldier Kings, the Crimea is a powerful minor state with seven armies (as many as Spain), though they are very weak. Its diplomatic modifiers are such that it will almost always ally only with Turkey. The depiction of the Khanate's military strength is about right: the Khan during the early part of the Seven Years' War, Arslan Giray, felt a Russian attempt to conquer his people inevitable and spent his reign building the Khanate's defenses. So tight were the Turkish-Tatar ties that we put him in Turkish colors in the game; while this is accurate — Arslan even commanded Turkish armies suppressing rebels in the Balkans — he should always start in Crimea. Send the Tatars to war in Soldier Kings, available now.